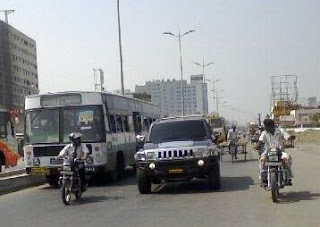 Hummer H3 finds path in India. India shining and Indians Rocking, of course this applies to all possible industries while not to leave Automobile segment. I remember we had only HM Ambassador cars on Indian roads, Also heard my grand father saying some Maharaja’s were denied procuring a Rolls Roys. But today the seens are changing in Automobile industry. The most talked TATA NANO is an Indian born car, most prestigious Europe brands like Landrover and US icon JAGUAR is now Indians owned brand. Is that stops all, no not really. The world war famous jeeps are even in action today in here, not to loose the thrill with offroad fun. This trend is keep growing and today I witnessed a Hummer H3 brand new Tamilnadu registered vehicle infront my office at Old Mahabalipuram Road. 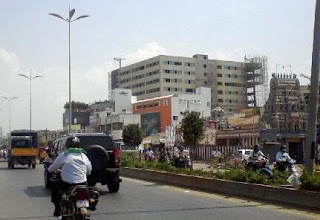 I was chasing the offroader in my bike to take couple of first shots of Hummer H3 in Indian roads. 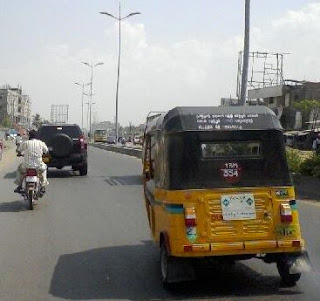 (Fun watching Hummer H3 competing with Auto rickshaws)It was amazing to see the world’s path on automobile is targeting in here, we have no infrastructure to compare to any other developed nation, But …. At one point I have to go infront of the Hummvy to take picture. Guess what it wasn’t only me starring at the offroader but all of the passing crowd. Look at this picture here, motorist attention goes towards Hummer, I envy the owner now. I will also hope no one should come forward asking for banning this machine as it distracts the fellow motorists. My travel today in the usual road turned out to be a great tour by spotting this Hummer H3. It is not known, why Indian roads are so poor. Ha ha ha ha it is Hummer way... We didn't make roads poor but we make roads for off roading!